Raw statistics can tell you a lot about a person. You might win once by luck, but consistent success in racing only comes about through hard work, commitment and passion. 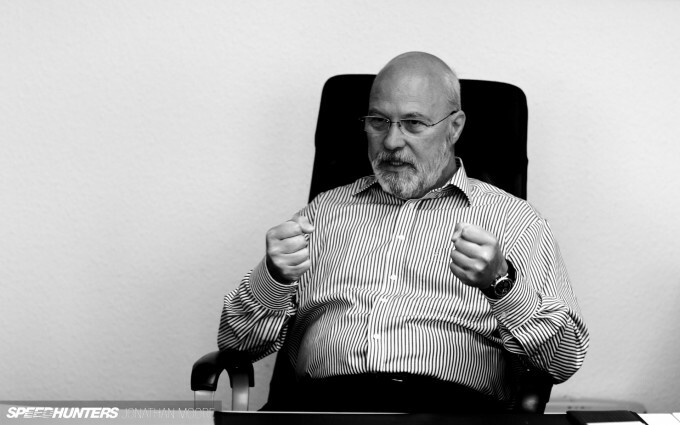 Reading through Olaf Manthey’s CV, you’re virtually bludgeoned with success. Three national championships as a driver, four as a team owner, countless victories over 30 years of competition… and the story is far from over. This year Manthey Racing ran Porsche’s factory GT effort at the Le Mans 24 Hours, and won first time out with the brand new 991. 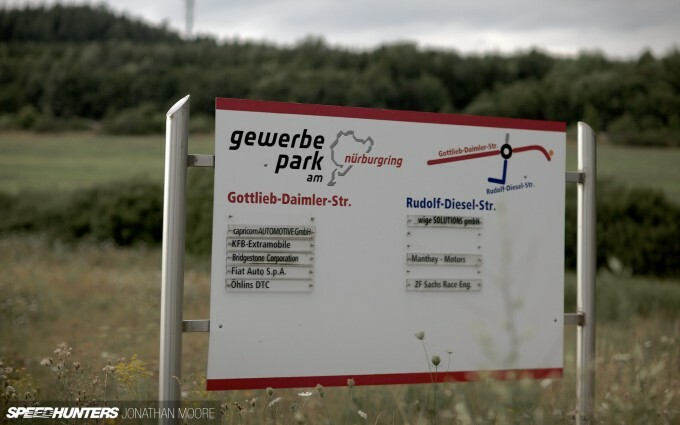 And as for the Nürburgring? Situated on the team’s doorstep, it’s their own personal playground. 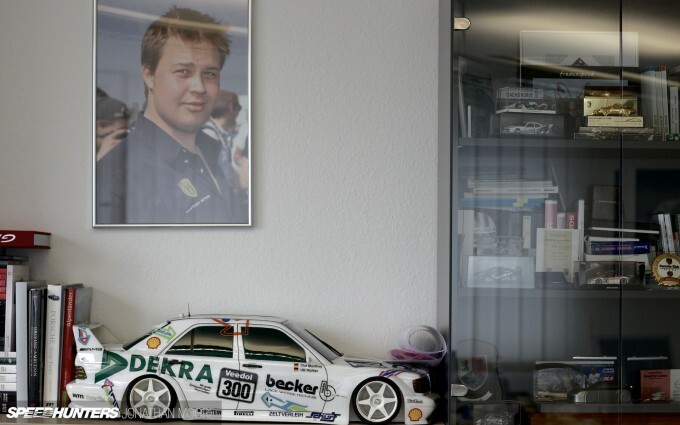 From his first visit as a six year-old to a race at the Nürburbring Nordschleife with his father, Olaf knew he wanted to be a racing driver. It seemed destined that the man, the moustache and his machines would end up being based in the Eifel mountains. From early on in his career, Olaf dominated races at the Nürburgring, though initially in machinery far removed from the marque he’s now so closely associated with. Starting with hillclimbs as soon as he turned 18, he soon moved to circuit racing; a season in Formula Vee helped refine his knowledge of set-up and aero, but Olaf was a man who preferred going sideways – at speed. 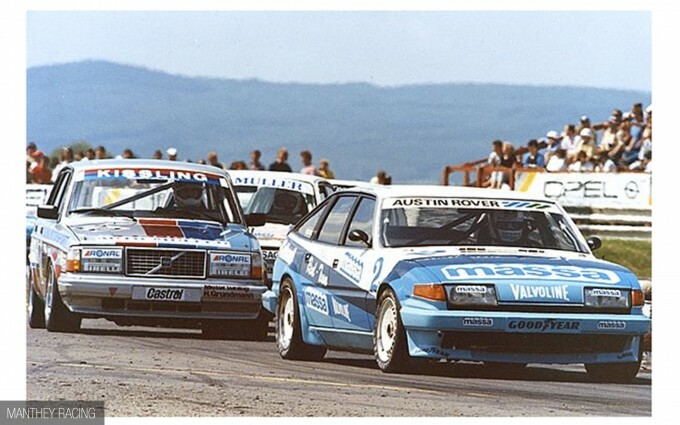 In ’82 and ’83 he swept Germany’s Ford Sport Cup in an RS2000 and then landed a factory contract with Austin Rover in the DTM. This was the era of big, tail-happy cars: Manthey’s 3.5 litre V8 Vitesse powered him to second in the DTM in ’84 and ’85 before he swapped to domestic machinery as the ’90s approached – first with BMW and then Mercedes. 1990 also marked his first contact with a Porsche. It was not a happy experience. Used to the power-sliding extravagance of front-engined, rear-wheel drive BMW and Merc saloons, his response after driving the new 964 Carrera on the Nürburgring Grand Prix track for the first time wasn’t repeatable. It didn’t suit his driving style at all. But that was hardly going to mean he wasn’t fast. 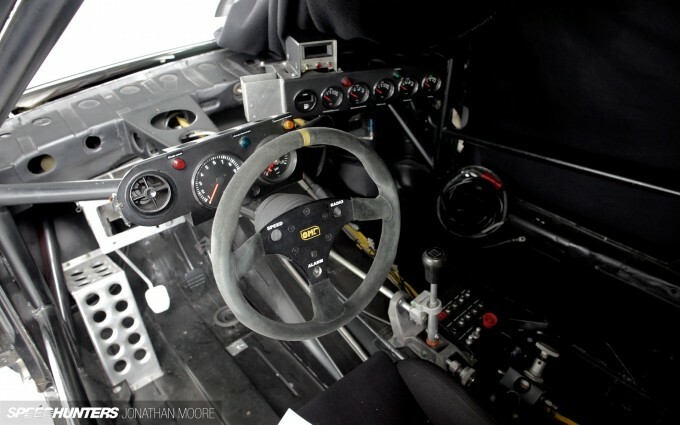 Quickly understanding the smooth style he’d require to make it go fast, he finally accepted Porsche’s offer – and won that year’s Carrera Cup championship, swapping between his BMW M3 DTM car and the Porsche as the two series shared race weekends. Between 1992 and ’95 he knocked in 22 wins for the 190 Evo II in the VLN series, whilst plotting his next move – a team of his own. 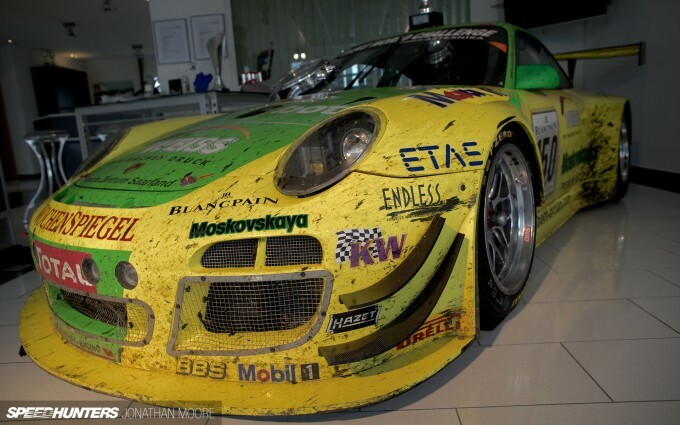 Manthey Racing hit the German racing scene and hit it hard: they won the Carrera Cup four years on the bounce between ’97 and 2000, whilst also running the factory Mercedes DTM programme. 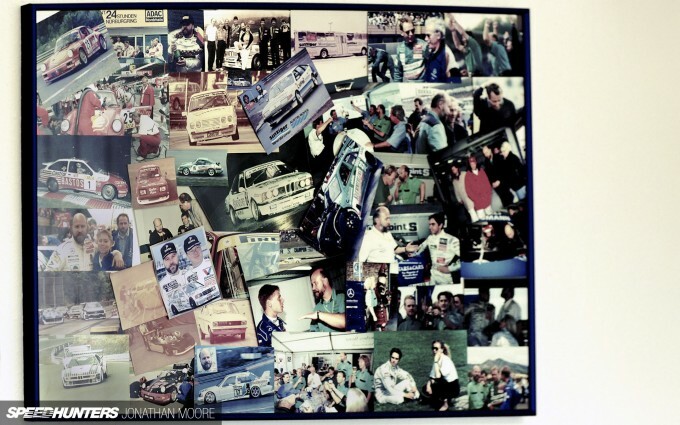 A lot of successful drivers from that period seem to have set up their own teams. According to Olaf, it comes from getting the understanding of what it takes to win. 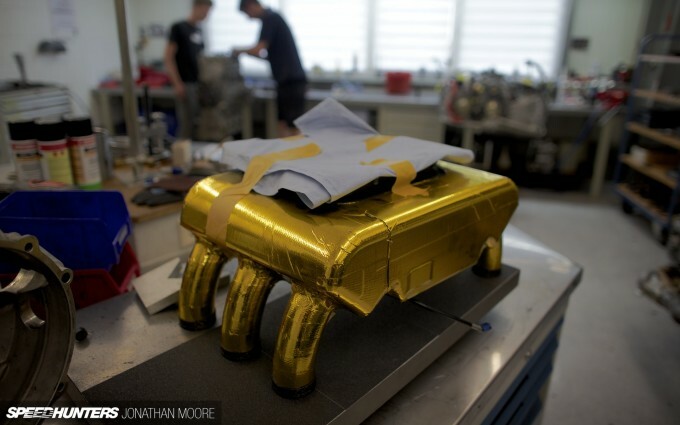 You need the fastest car, the best team and the best driver: lack for one, and it’s an uphill battle. Frustrated with engineers who didn’t race themselves, he knew his wide experience would prove an advantage: everything could be targeted on making the driver’s job easier. Prepare hard, win easy. Olaf was already finding sponsors, but knew that industry partners were key; he’d also built most of the cars he’d raced, using his background in mechanical engineering. Here was a man who ticked every box. The team’s professional collaboration with Porsche began in 1999, when Manthey ran the first water-cooled Porsche GT3R to class victory at that year’s Le Mans 24 Hours – not a bad way to start the relationship. 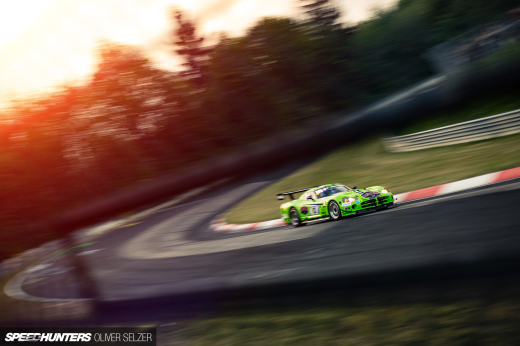 But the lure of endurance racing at his spiritual home of the Nordschliefe was irresistible, and Manthey Racing became regular competitors around the ‘Ring. Their first overall win came in 2006, and since then they’ve won a further four times – plus the impressive debut of the Hybrid R, using a Williams F1-developed flywheel system, in the 2010 race. This year they took another class win at the Nürburgring 24 Hours and also finished second at the Spa 24. 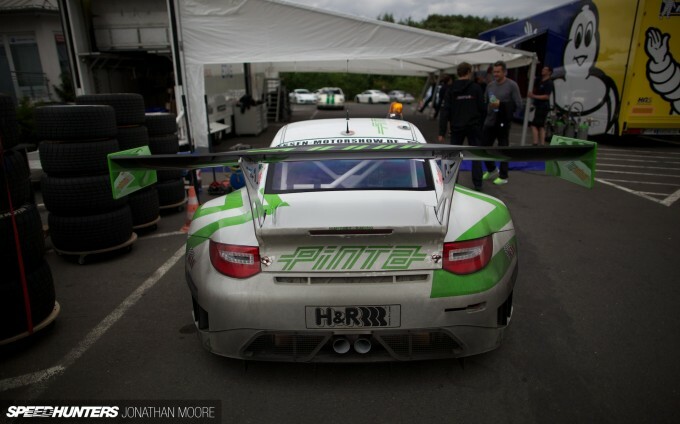 It’s the Nürburgring that has gestated some of Manthey’s most extreme Porsche racers. 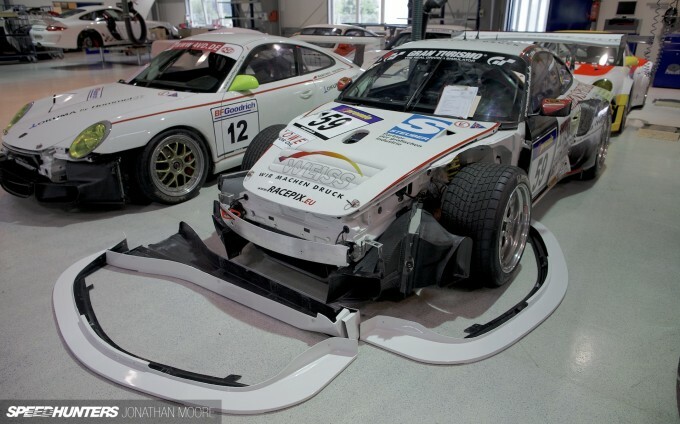 Using his technical know-how and the freedom of the VLN regulations, in Olaf’s hands Porsches have often become brutal weapons – and yet somehow they’ve managed to modify Porsches without incurring the wrath of the mothership, which is a rare trick. Manthey Racing were originally based in Olaf’s hometown of Bonn, where they not only ran the race team but also worked on street car upgrades. Today’s set-up is a far cry from the original humble 450m-square workshop with four people. 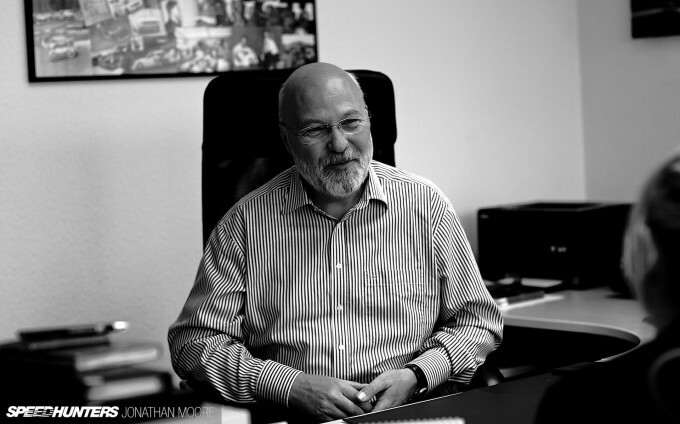 With the new industrial park created right next to the Döttinger Höhe straight on the Nordschleife and Olaf visiting the track virtually every week, the decision to move the team wasn’t difficult. 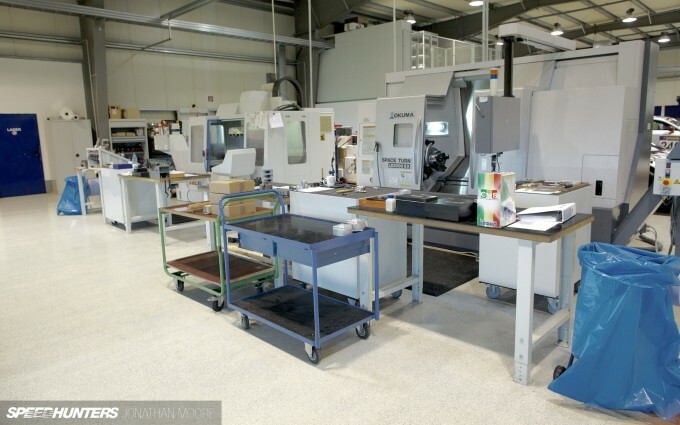 In 2000 Manthey moved to Nürburg and a purpose-built 11,000m-square facility. 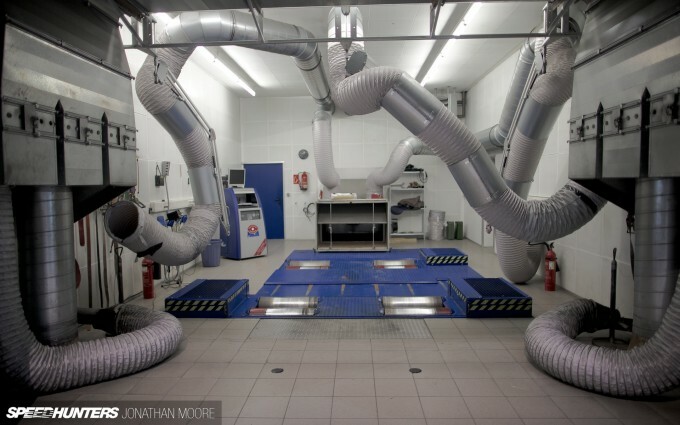 The main workshop area is used for preparing both street and race cars: mechanics work on both to keep a flow between the two sides of the business. 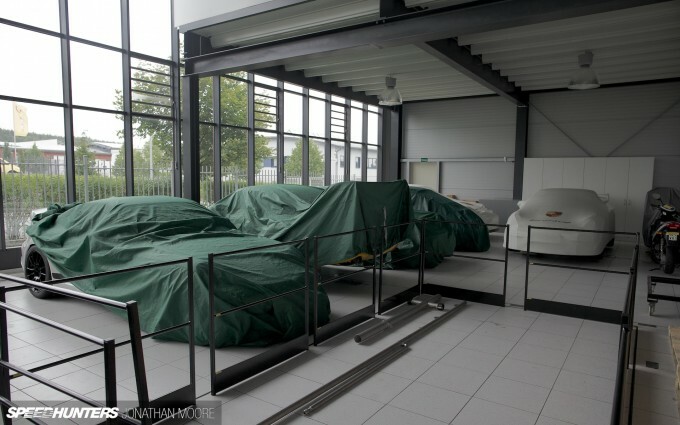 …along one wall a line of road and race cars sit on lifts being worked on. The team support a number of other teams in the VLN, preparing and storing the cars between races, and supporting the drivers over race weekends. The idea is that the drivers can pick up their trophy and be home with their family come the evening, whilst the team take care of the car! 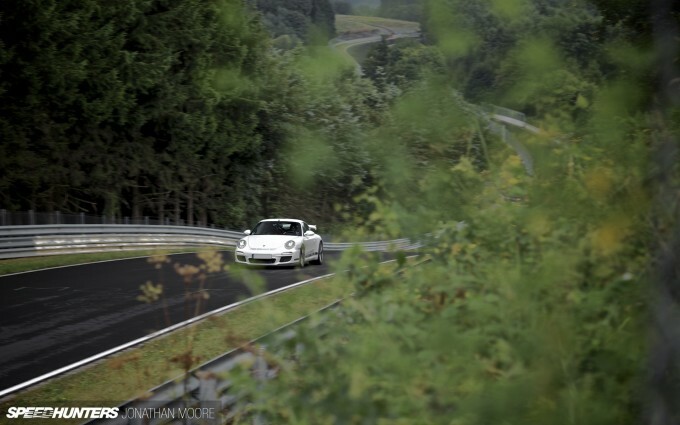 Once a year Manthey hold a track day on the Nordschliefe – Porsche only of course – for their customers, but they have also taken their experience further afield. I was interested to spot this poster for a day held at Roppongi in Japan, for instance. 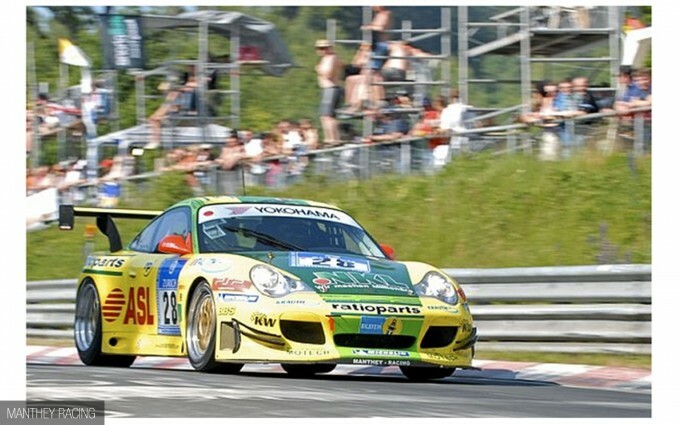 My visit to Manthey had coincided with this year’s trackday, which meant that a couple of days previously I’d seen several of these cars hammering around the Nordschleife. 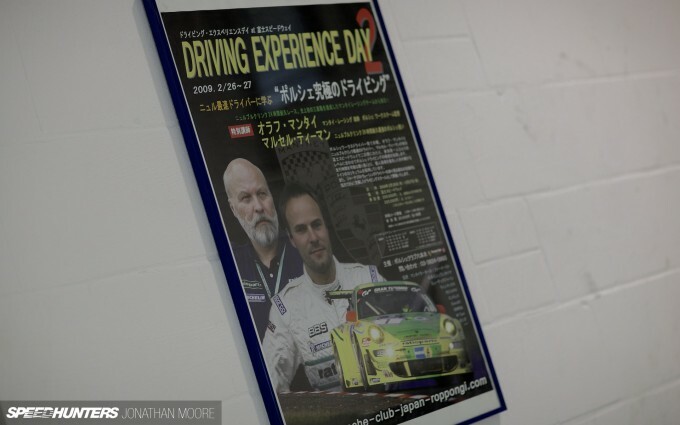 Manthey are supported by several partners at these events – Michelin and KW Suspension, for instance – and also provide professional drivers to help teach their customers not just the best lines around the Nürburgring but also show them just what their car is capable of. Or could be with a Manthey Motors upgrade! 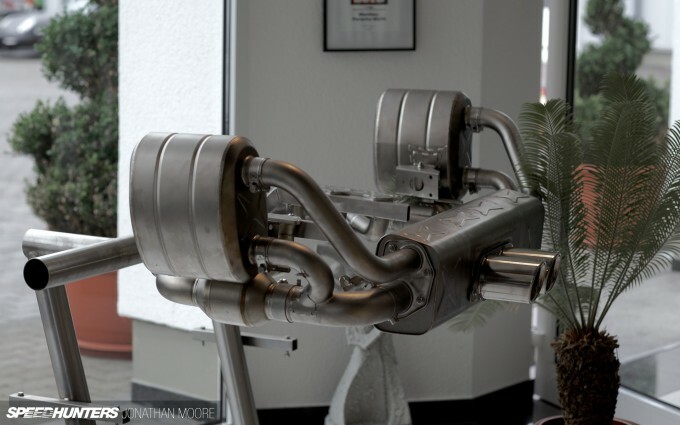 Manthey have full dyno and rolling road facilities, with the four-wheel drive system capable of handling cars rated up to 850hp. 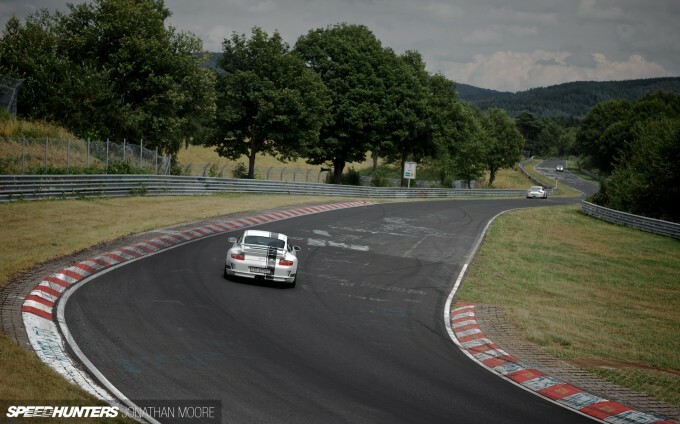 New parts or upgrades are tested here first, but the ultimate proving is always done out on the Nordschleife. 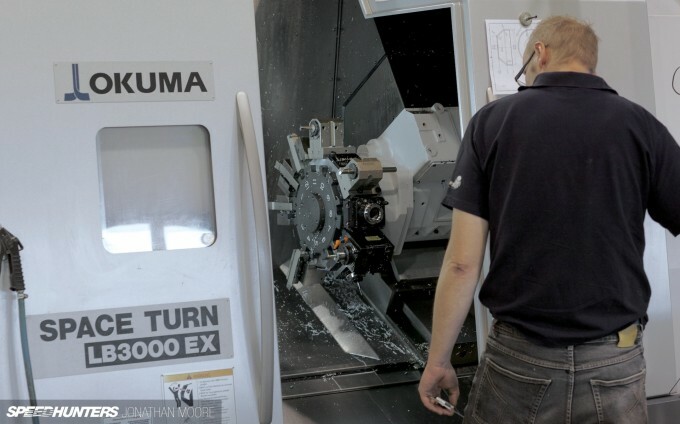 Over in the engine shop, once again road and race engines are worked on side by side – and Olaf’s hands-on nature was clear to see as he immediately started tinkering with this unit as I was taking images of the workshop! Manthey do all their engine and gearbox upgrades, rebuilds and repairs in-house, with only the World Endurance Championship GTE programme based off site. 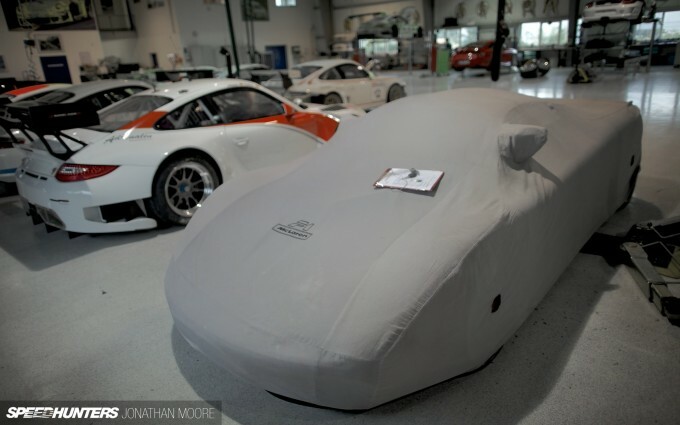 Wind tunnel work is also carried out at Weissach. Across the yard, the second largest hall contains both the manufacturing area and space for future expansion. 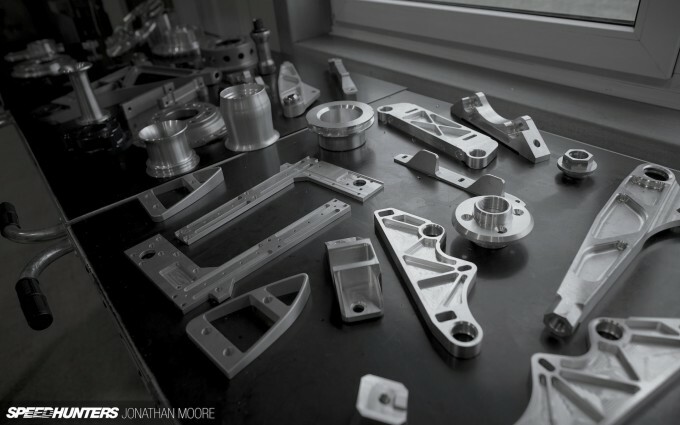 … which allows them to be pretty self-sufficient in developing a variety of new parts. 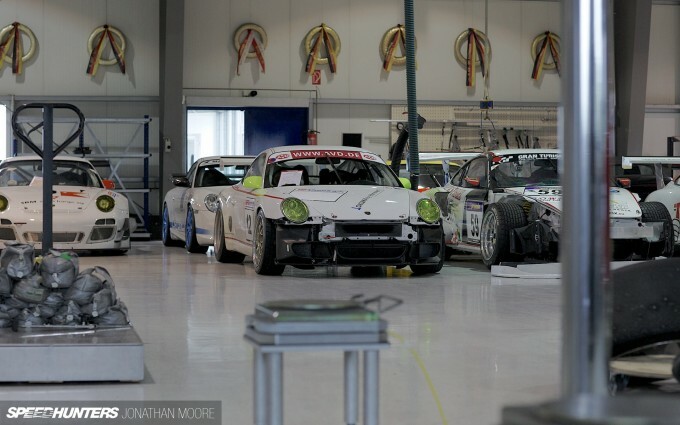 Tucked away in a corner was one of the few old race cars that Manthey still owns. 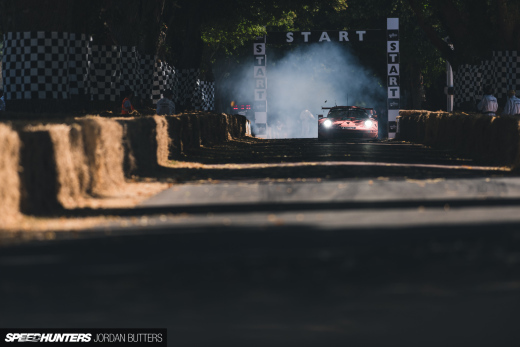 Although the workshops are full of trophies and posters, actual old cars are few and far between – the focus is firmly on the present and future it would seem. 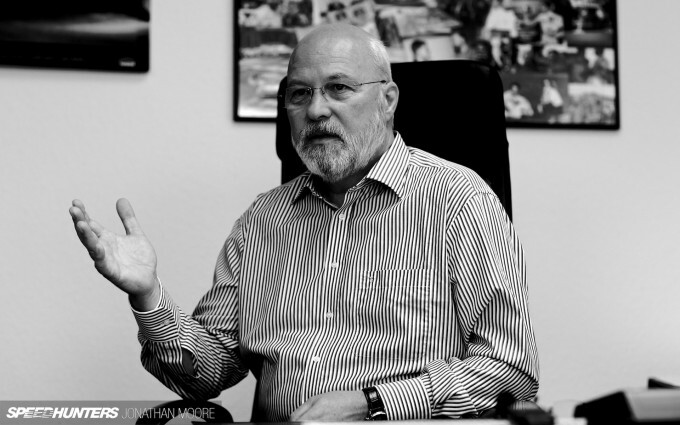 Olaf has only kept three of his own personal cars, two of which were stored in Manthey’s large, glass-fronted showroom. …but along with Olaf’s own 993 (he also has his Rover street car off-site) was a rather more unexpected vehicle. 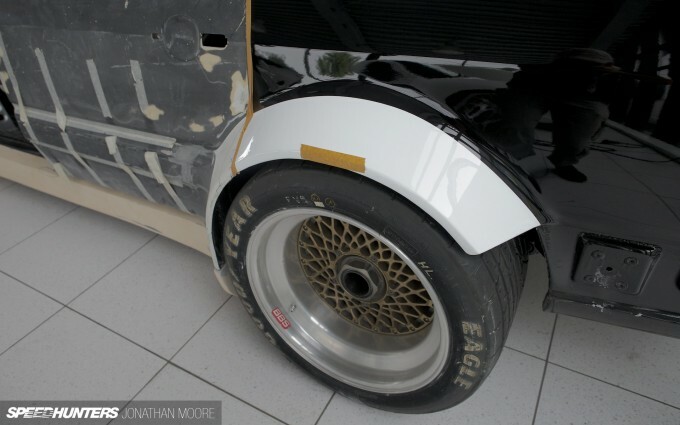 Olaf set set several World Speed records for Audi in the late ’80s: three 200 Turbos were run at the Nardo test track – 650hp five-cylinder turbos with four-wheel drive which achieved a number of sustained high speed records over 500 mile and 1,000km distances at over 200mph averages. Rebadged as Audi CS5000s, cars were also run at Talladega in the USA; this is one of those cars. 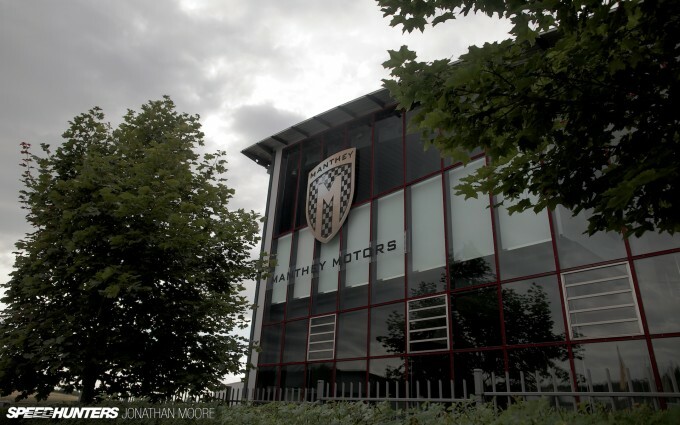 Each winter Olaf has been working on restoring the Audi, which is now nearing completion. Just as he did in the old days, Olaf has been doing the work himself: creating new panels and preparing the engine – a 2.1-litre turbo, mounted surprisingly far forward in the nose. 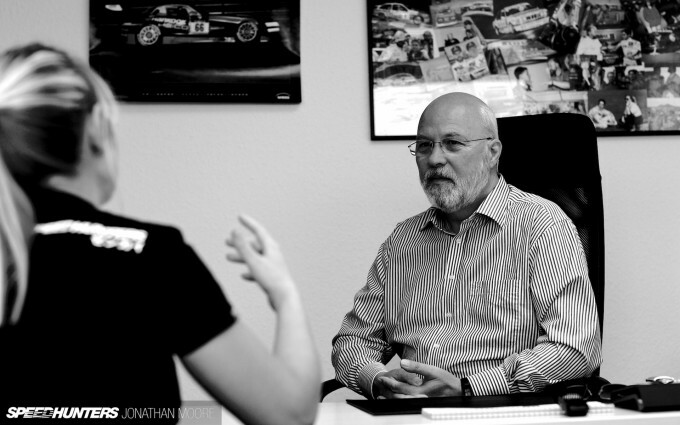 Meanwhile, the road car side is still a large part of the business: Manthey Motors are serious players in Porsche tuning. 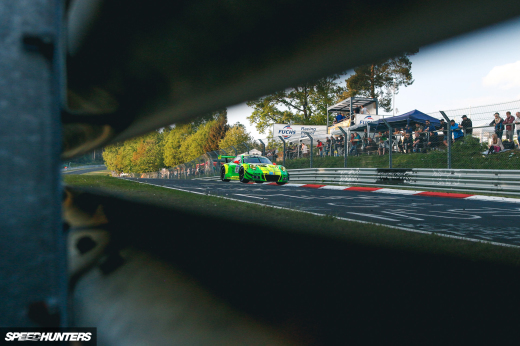 When you consider the challenges that a regular road car has lasting just a couple of laps of the Nordschleife, a team that has the experience of producing race cars that can last 24 hours has quite some advantage. It’s that knowledge transfer that means Manthey-prepared street cars are very special pieces of kit: Manthey Motors produce lightweight panels, such as carbon bonnets and roofs, along with suspension, exhaust and engine upgrades. As with any serious team, the overriding concern is always an obsession with weight. 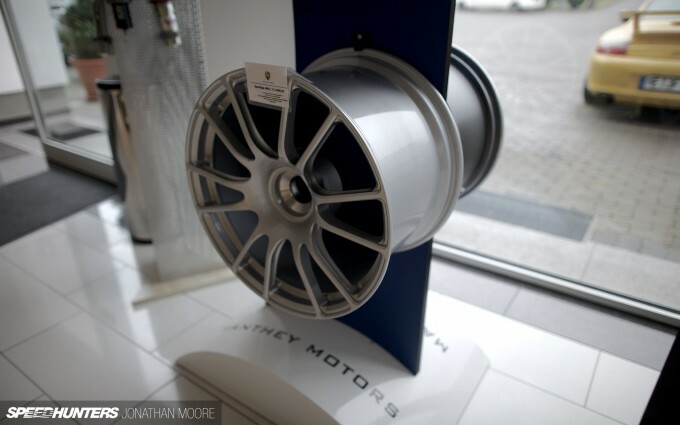 Manthey’s bespoke forged wheel range can knock 10kg of unsprung rotating weight off the car: the equivalent of up to six times the amount of sprung weight. Awesome! I love the revamped site. Although I'm still hoping for a nice wallpaper of the top garage photo. Gareth36 That is true for the most part, just not that top photo. HOWEVER, it so happens that this top photo is one of the showcased photos from the main page of the website (bottom section). So in the end, I'm good.